This is a cool service called Track My Subs that gives you effortless control of your subscriptions with perfectly timed alerts you can set and forget. 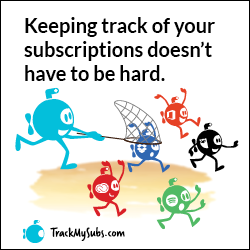 TrackMySubs is like having your own virtual assistant keeping watch on all your recurring payments. …Oh, and you can also use it for warranties, rent, loan repayments, gym memberships, and pretty much anything else you’d like to keep track of, or be reminded about – at the perfect time! It could be that you are paying for services you don’t want anymore, and those fees could otherwise be applied to something else you really want or need. Take this out for a spin and see how much you love it! LeadPages is what all the big players are using today. Check out how easy this system is to use and how well it works for you! Here’s a 21-day, $1 Trial to a InstantTeleseminar! I highly recommend it — lots of unique features. It’s the service I use for all my “Bio Doc is In” and other training calls. Click on the link above to check it out. Automated Webinars – Stealth Seminar!!! If you have a video, teleclass, or a webinar that you know converts reliably, automate it. Stealth Seminar has the most amazing client support people who actually “do it for you” so you can just let the system work to your expert and profit advantage. • Want to build a better blog? Darren Rowse at Pro Blogger is the expert I trust. Visit this site to learn more about this action-oriented workbook that helped me grow blog traffic by 62% in 2009. • Visit www.JohnKremer.com to learn about 1001 Ways to Self-Market Your Books and so much more. • Visit www.DanPoynter.com for even more resources about self-publishing your books. • www.yousendit.com works great for large files, and it’s free! Victoria Vinton does a FABULOUS job for just about all of my graphic design needs. She’ll do a great job for you, too. Need a speaker sheet that turns heads in a good way? She’s your gal! Need branded, beautiful marketing collateral to put your best image and message forward? Look no further. Call her at 619-698-5960, and tell her Nancy Juetten referred you. You can also visit Victoria on the web at www.coyotepressgraphics.com or by email at victoriavicton@cox.net. Help a Reporter Out – A free service that brings active media queries to your in box. Sign up at www.helpareporter.com. PitchRate – a free service that brings even more active media queries to your in box. Sign up at www.pitchrate.com. • Need to set up an online shopping cart – This is a link to learn more about the system I use. I’ve been using Practice Pay Solutions since I set up my online shopping cart in 2006. I set up the account at the recommendation of several people who recommended this service as my payment gateway, and I have been consistently impressed by the customer service, the reporting, and the great educational resources the company provides in service to my success. If you have questions about setting up an account, you can contact Fran Garuvuso in the client relations department at fgaravuso@practicepaysolutions.com. Visit this link to learn more. Want to Learn Even More About How to “Get Known to Get Paid™”? • Ask for an application for Nancy’s Get Known to Get Paid PRIVATE mentoring program. You actually want to create your own WordPress website without having to rely on your webmaster? You are not alone. Hundreds of people just like you are doing that with Wizard of WordPress Guide Christina Hills as their guide. She’s got a well reviewed and popular Website Creation Workshop brewing for launch this spring, and you can click here for all the details. You can do this, and Christina can help. These are recommended resources that have earned the respect of Nancy S. Juetten through her personal and proven, in-the-trenches experience. Nancy S. Juetten Marketing does not accept responsibility for any purchases you make, business you conduct, or relationships you may initiate with anyone listed within this directory. The nature of directory publishing is that listings may become inaccurate as time passes. Please direct any bad links or changes in information you may learn to our team at nancy@getknowngetpaid.com . We appreciate it. Nancy S. Juetten may receive compensation from some of the entities listed for referrals, as their “thank you” for sending you their way. However, we NEVER recommend any service or product solely for the reason of receiving commissions (and neither should you) – our reputation is on the line. ©2018 Nancy S. Juetten Marketing Inc. Updated March15, 2018.